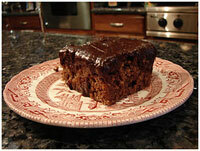 It may sound crazy, but Chocolate Mayonnaise Cake is one of the moistest cakes you can make! What? Chocolate Mayonnaise Cake....you've got to be kidding! I'll save my mayonnaise for a BLT sandwich....not for cake baking. If that's your attitude...then let me try changing your perspective. Sometimes you just have to take a leap of faith....and that applies to the kitchen. There are people out there with an aversion to eggs or need to cut down on their fat intake, but at the same time love the idea (and taste) of a good old fashioned chocolate cake. So what are their options? That's right...add some mayonnaise to your favorite recipe and be rewarded with a cake that is so moist and delicious that you'll forget what some of the zanier ingredients are. 2. Grease and flour a 9x13-inch pan. 3. Stir together the flour, cocoa, soda and salt. 4. Cream together the sugar, mayonnaise, water and vanilla. 5. Add the dry ingredients to the creamed mixture and stir until well blended. 6. Pour batter into the prepared pan and bake for about 25 minutes or until done.